CRYSIS 3 – ORIGIN This product is a digital code, once bought, the code will be sent to your email or can be downloaded directly from your screen. These codes are original and produced by Origin. The fate of the world is in your hands. New and old enemies threaten the peace you worked so hard to achieve 24 years ago. Your search for the Alpha Ceph continues, but this time you'll also need to expose the truth behind the C.E.L.L. Corporation. It won't be easy, but your Nanosuit helps you clear a path to victory. Craft a stealthy attack to defeat your opponents quietly, or decimate the enemy with a blaze of brute force. There's no wrong way to save the world. With our Crysis 3 Key that is able to be activated on Origin and allows you to digitally download the Crysis 3 PC Video game. You'll be able to experience the 1st person shooter that Crysis fans have been clamoring about for years. Crysis is a video game series that is known to have some of the highest graphical fidelity out there among first person shooters due to the Crysis engine sparkling like a diamond. 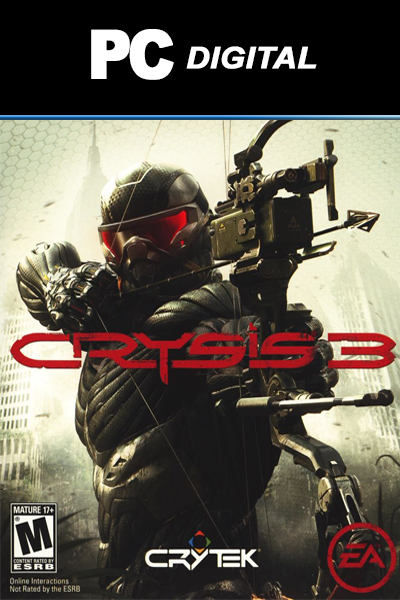 CRYSIS 3 - ORIGIN– is available right here at livecards.co.uk for the best price. The standard price for CRYSIS 3 - ORIGIN– will vary depending which store you purchase it from. Our CRYSIS 3 - ORIGIN– codes are 100% legit (you can check our FAQs) and some of the Cheapest CRYSIS 3 - ORIGIN– codes available in the market. Our prices are low because we buy in bulk allowing us to offer discounted CRYSIS 3 - ORIGIN– codes. Master the Seven Wonders. The evil C.E.L.L. corporation turned New York City into a sprawling urban rainforest housed in a giant nanodome. Devise new tactics to fight your way through seven distinct landscapes and confront the enemies hiding within. Choose your arsenal. This fight requires the best weapons available. You'll have an arsenal stocked with Earth's finest military tools, like the Predator Bow. Use it to unleash a Super-thermite arrow and counter heavy artillery fire. Facing a group of opponents walking through water? Fire just one Electro arrow and defeat them all at once. Order our Origin PC Key today to get access to Crysis 3 and digitally download it on Origin for a cheap low price that no other Key website can compare to. How to buy Crysis 3 PC? Livecards.co.uk makes buying Crysis 3 PC as easy as pie! All you need to do is fill in your email address, pick a payment method, complete the payment and voila! The code is yours.